I found out this past week that I did not get into the craft fair I had applied for. It may be a blessing in disguise. A new project has cropped up unexpectedly - a memory quilt for my aunt and her step-kids (who aren't kids anymore, of course). Possibly even two quilts. My uncle passed away unexpectedly after complications from a surgery. My aunt seems to be keeping it together much better than I could imagine, but thankfully has a great support system too. She asked me if I'd be up for making a memory quilt from his ties and shirts that she can give his kids for Chanukkah. Of course I said, "yes" though that was before I learned of the proposed deadline ;-) So I reiterate, it may be a good thing that I don't have the craft fair to worry about finishing all of that holiday inventory I have been spending my time on. After looking through the box of clothing she sent, I wasn't sure what approach I would take for this. Then I was browsing Pinterest over my morning coffee just today and saw a picture that I had seen months ago on Debbie's blog, A Quilter's Table. The first photo, the Hugs and Kisses block, on her 2nd quarter Finish-A-Long post inspired me even before having this project. But when I saw it in the context of this memory quilt, something just clicked. Debbie linked to the tutorial she used, written up by Little Miss Shabby. 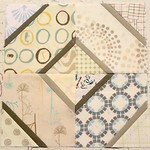 Can't you just picture a quilt with these great prints on the blocks?? And those accent strips are perfect for the ties! This is a new venture for me, but one I am glad to be able to take. However, I will admit, taking the first cut will be the hardest.